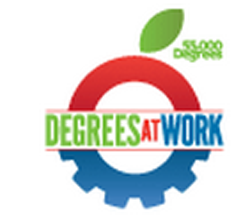 Serving Jefferson County in Kentucky, DegreesWork joined the Network in 2013. We calculate that there are 90,000+ adults in the Greater Louisville area who started college but did not complete. Degrees Work is a part of the 55000 Degrees initiative in the Louisville area – increasing the number of college degrees by 55000 by the year 2020. Increase the number of adults completing college an additional 15000 by 2020. Great sense of community, a thriving art and cultural community and some of the best food in the US. Plus what’s not to love about Derby and bourbon!